Pure Fun Trampoline Accessory: Shoe Storage Bag by Pure Fun at Ipswich Recreation. MPN: 9216SB. Hurry! Limited time offer. Offer valid only while supplies last. 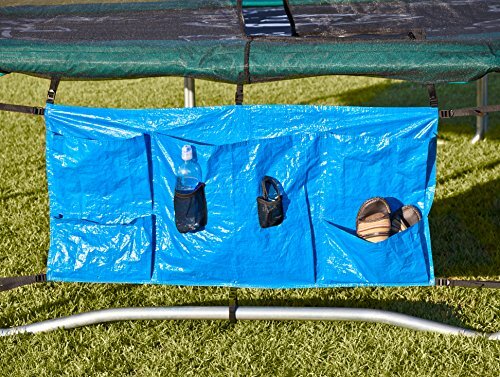 Keep your stuff protected and out of the way while you're jumping with this handy bag that attaches easily to any Pure Fun round 8' - 15' trampoline. Keep your stuff protected and out of the way while you're jumping with this handy bag that attaches easily to any Pure Fun round 8' - 15' trampoline. Features five large pockets for shoes and accessories, as well as two smaller holders for a bottle and cell phone. 1 Large Center Pocket: 19" x 19" x 8"
4 Shoe Pockets 11" x 11" x 6"
If you have any questions about this product by Pure Fun, contact us by completing and submitting the form below. If you are looking for a specif part number, please include it with your message.